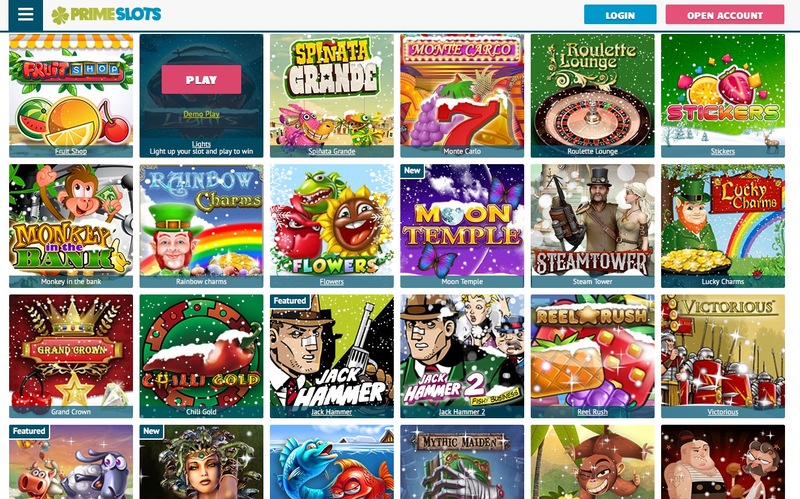 Prime Slots is a bright and funky interactive soft games site, featuring over 150 different titles, including scratchcards, instant win games, bingo, slots, and lottery products. No need for a cumbersome download – all games are available to play directly through your browser via Flash, or on your mobile phone. The site runs on the relatively unknown NeoGames software, so plenty of the games will be unfamiliar and novel. Look out for simple one line slots, five line games, eight line and nine line slots, plus 20 and 25 lines. A smattering of branded slots are available, such as Monopoly, ELVIS FOREVER, the Fantastic 4, and Bejewelled. Progressive jackpots run into the millions. Neogames have a user friendly interface, and the design team strive to 'maximise entertainment for all ages'. If you're fed up of the standard Microgaming casinos, and are questing for something a little out of the ordinary, then certainly try Prime Slots. If you're a tad cynical about signing up, then take advantage of the £5 free bonus. No deposit is needed – you can win big with real dosh. The site runs regular tournaments, where you compete against other players to reach the top spot on the leaderboard. The leaderboard updates in real time, and there are cash prizes if you play online, and not mobile. Note that tournaments are only accessible via the web browser. As a VIP at Prime Slots, you can climb right up to Champion level. As a champion, you get an exceptional redemption rate for your reward points, plus VIP only competitions, and free gifts. Cash outs are fast and secure, as all credit and debit card transactions are processed by NG International. Responsible gaming is recommended at all times. One of the most notable games on the carousel is called Eggomatic, and this really showcases the genius from the design team at Net Entertainment. This quirky game is starkly different from any other slot I've ever seen – graphics are top class, and the gameplay will have you crowing with delight. In the Eggomatic game, a rooster has invented a high-tech egg production line, and in the factory, different types of egg are produced. However, the production line has broken, so the hapless rooster has to start catching eggs himself. Every few minutes, the egg machine turns an egg out onto the conveyor belt, which could be a wild symbol, win amount, or a different number of free spins. Each time you spin, the eggs move along one position, to the right of the reels. Slots, casino, blackjack, scratchcards, bingo, branded slots. The site has a refreshing green and white colour scheme, although it's not particularly exciting. Make your way through to Champion level to reap the rewards. Prime Slots is a brand owned by Prime Holdings Ltd, a company based in the British Virgin Islands. The games are powered and operated by NG International, a company based in Malta. Try Prime Slots today for a £5 no risk bonus. Claim a 100% welcome bonus on your first deposit. In Club Clover, take advantage of the best promotions, grandest offers, and sneak previews on upcoming games. Battle it out in a real-time tournament if you are feeling competitive.